We are noted the leading industry in the domain engaged in offering Cement Brick Making Machine. Demanded in the construction industry for optimum performance, resistance to corrosion, our offered block machine is tested on quality provisions for supplying a flawless range. Incepted in the year 2005, in Coimbatore (Tamil Nadu, India), we “Shree Karpagam Engineering & Traders”, are a well-established organization engaged in manufacturing, trading and supplying a large assortment of solid block making machine,hollow block making machine, desinger tile machine,concrete pan Mixer Machine,autofeeder block making machine, concrete mixser machines,paver block machines fly ash brick making machines ,etc. The offered machines are extensively acknowledged by our clients for their variegated features like heavy duty design, smooth functioning, less maintenance, hassle-free functioning and many more. These machines are precisely manufactured using ultra modern technology and premium quality components in line with set industry standards. 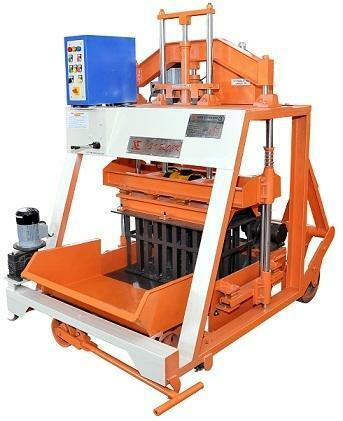 Available in different specifications, our offered machines are useful for resolving of problems of baking industries. The exterior of these machines are coated with high grade materials that ensure constraction machineries . Apart from this, the offered machines are also available in different specifications in order to cater the specific demand of our clients.